Editors Note: Two maps are included with this press release. Medusa Mining Limited (TSX:MLL)(ASX:MML)(AIM:MML) ("Medusa" or the "Company"), through its Philippines operating company Philsaga Mining Corporation ("Philsaga"), announces an update of drilling results for holes MD 165 to MD 216 from the Co-O Mine subsequent to the announcement of 1 July 2009. 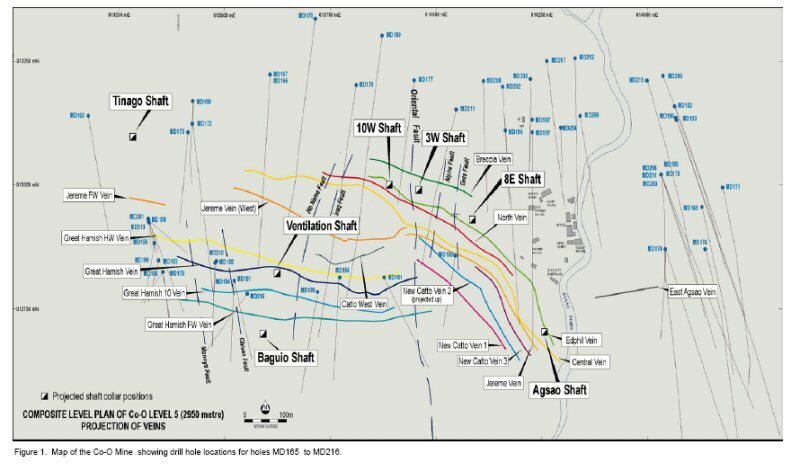 High grade drill intersections to the east of the Co-O Mine confirm strike extensions of the vein system to around 1,400 metres. These results will be incorporated into a new resource estimate which is expected to be available in January 2010. Separately, away from the Co-O Mine, 16 holes of an on-going regional drilling programme have been completed to test other veins. Several holes have returned strongly anomalous results with individual samples returning 0.5 to 5g/t gold in the context of vertically zoned epithermal veins and potentially mineralised structures. "These very high grade results continue to confirm the quality of the Co-O Deposit. Our drilling campaign will continue at the Co-O Mine for the next six months with the aim of defining further opportunities for expanding the mine infrastructure. The regional drilling will systematically explore other vein systems away from the Co-O Mine, which if successful, could contribute to the possibility of diversifying our sources of mineral resources". Figure 1 (attached) shows all the MD series diamond drill holes from MD 165 to MD 216 totalling 27,182.7 metres which have been completed around the Co-O Mine since 1 July 2009. The on-going drilling programme has concentrated on infill and extensional (up and down dip, and lateral) drilling in and around the Co-O Mine. Table I lists the surface diamond drilling results greater than 3 g/t gold from the Co-O Mine for drill holes from MD 165 to MD 216. These drill hole results will be incorporated into a new resource estimate which is expected to be available in January 2010. Other reports containing intersections for holes numbered below MD 165 were announced on 1 July 2009, 1 December 2008 and 11 August 2008. In 2007 the announcements are dated 9 July, 15 May and 28 February. The 2007 announcements also contain information regarding drilling and surveying techniques, comments on vein interpretation and methodologies and assaying protocols. Most of the results in the announcement dated 1 July 2009 which are east of the Agsao River have yet to be incorporated into a resource model. Now that a significant amount of on-vein development has been completed from the bottom of the Agsao Shaft (Level 5) and vein orientations are established, most of these previous drill results are now expected to be used in the forthcoming estimate. Results down to 0.2 metres wide are reported since underground development shows that in many cases as the veins approach cross-cutting faults, they narrow down on both sides of the fault over 5 to 10 metres before widening out, and hence the narrower intersections are important in defining vein continuity. There is also some pinching and swelling of veins along strike. Most drilling is sub-parallel to the fault direction and rarely intersects the faults, which are subsequently identified by underground on-vein development. Table I. Drill hole results greater than 3 g/t gold and greater than 0.2 metres downhole for holes MD 165 to MD 216. (iv)    Assays awaited for MD 212, 214 and 215. Using the Co-O Mine as a model, drill testing has commenced on veins in the vicinity of the Co-O Mine to delineate new resources which could be developed with minimal mining infrastructure costs. The Co-O vein system outcrops at surface on the western side of the Oriental Fault, where it was first discovered. The veins at surface rarely exceed 0.5 metres width and generally assay around 1 to 5 g/t gold (with possibly some supergene enrichment). Gold values started to increase significantly approximately 80 metres below surface. To date 16 drill holes (EXP 1 to 16) as shown on Figure 2 (attached) have been completed. Results are available for EXP 1 to 12 where strongly anomalous values have been obtained from a number of individual samples in excess of 0.5g/t gold and up to 5.13g/t gold. These mineralised structures will be assessed for further follow-up either along strike or at depth. Table II. Drill hole results greater than 0.5 g/t gold for holes EXP 1 to 12. (iv)    Intersections widths are downhole drill widths not true widths. In the area of Bill's Vein to the east of the Co-O Mine (Fig. 2), interpreted younger sedimentary and volcanic cover (conglomerate andolcaniclastics) appears to thicken in this area and at depth is partly intruded by strongly magnetic andesitic porphyry. Further work and interpretative modelling is required to unravel the structural implications. Drilling with six surface rigs will continue on the Co-O Mine area until June 2010 when the majority of the rigs are planned to be transferred to commence feasibility study related drilling at the Bananghilig Deposit. 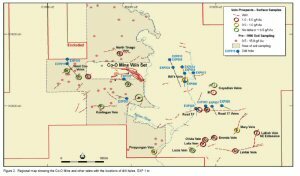 Two to three drill rigs will continue exploring untested vein systems away from the Co-O Mine area. Samples were taken from mainly HQ sized and some NQ sized drill core. The selected sample intervals were halved by diamond saw and half the core was bagged, numbered and sent to the Company laboratory. In a small number of cases to confirm the geological logging, the selected interval was re-split and 1/4 core re-submitted for assay. Initial sample preparation and assaying was undertaken at the Company's on-site laboratory. Samples were dried at 105 degrees Celsius for 6 to 8 hours, crushed to less than 1.25 cm by jaw crusher, re-crushed to less than 3 mm using a secondary crusher followed by ring grinding of 700 to 800 grams of sample to nominal particle size of less than 200 mesh. Barren rock wash is used between samples in the preparation equipment. The samples were assayed by fire assay with Atomic Absorption Spectrometer (AAS) finish on a 30 gram sample. All assays over 5 g/t gold were re-assayed using gravimetric fire assay techniques on a 30 gram sample. The majority of samples which contained more than 0.5 metres at more than 2 g/t gold were re-assayed by McPhar Geoservices Phils Inc ("McPhar"), a NATA and ISO 9001/2000 accredited laboratory in Manila. The pulps were airfreighted to McPhar who fire assayed 30 grams of sample using AAS finish and a selected number of samples were checked using gravimetric fire assay techniques. Duplicate samples and standards are included in each batch of check samples. When reporting results, where available, the assays of McPhar as an independent laboratory have given priority over the Company laboratory's results. Information in this report relating to Exploration Results is based on information compiled by Mr Geoff Davis, who is a member of The Australian Institute of Geoscientists. Mr Davis is the Managing Director of Medusa Mining Limited and has sufficient experience which is relevant to the style of mineralisation and type of deposits under consideration and to the activity which he is undertaking to qualify as a "Competent Person" as defined in the 2004 Edition of the "Australian Code for Reporting of Exploration Results, Mineral Resources and Ore Reserves" and is a "Qualified Person" as defined in "National Instrument 43-101" of the Canadian Securities Administrators. Mr Davis consents to the inclusion in the report of the matters based on his information in the form and context in which it appears. Refer to the Technical Report which was filed on www.sedar.com in November 2009 for further discussion of the Co-O Deposit's geology, structural controls, drilling, sampling and assaying information, and any known material environmental, permitting, legal, title, taxation, socio-political, marketing or other relevant issue. Medusa Mining Limited ("Medusa" or the "Company"), a public company listed on the ASX, AIM and the TSX, is an Australian based gold producer, focussed solely on the Philippines. With total mineral current resources of over 2,000,000 ounces of gold, Medusa's corporate strategy is to become a mid tier 300,000 to 400,000 ounce per year, low cost gold producer. 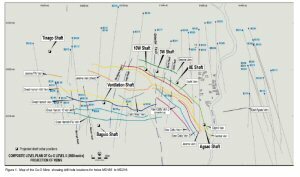 The Company is currently expanding its high grade Co-O Mine operations (total resources of 1,380,000 ounces at 10.8 g/t gold) to increase its production capacity to 100,000 ounces per year in 2010, and is conducting near mine exploration to assess the possibilities of further expansion to 200,000 ounces per year. Current cash costs at the Co-O Mine are approximately US$200 per ounce. A pipe-line of deposits is now being established with the Bananghilig Deposit (resource of 650,000 ounces at 1.3 g/t gold) recently added and which is expected to expand, potentially in conjunction with new nearby discoveries. 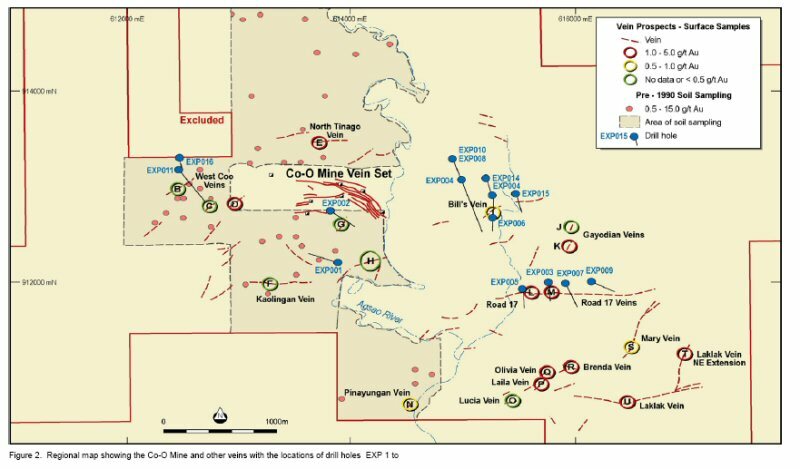 Further potential upside exists in the discovery of substantial copper deposits within the tenement holding of greater than 800km2. Figure 1. Map of the Co-O Mine showing drill hole locations for holes MD165 to MD216. Figure 2. Regional map showing the Co-O Mine and other veins with the locations of drill holes.